Did Your Tax Dollars Pay for This David Barton Conference? 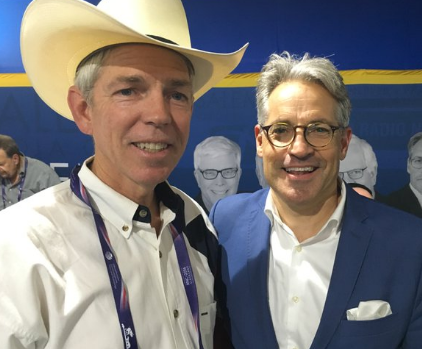 Periodically, David Barton and his Wallbuilders organization bring together state and federal legislators for briefings and pep talks about how to promote the Christian nationalist legislative agenda. This is of course is how grassroots politics works and he has every right to do it. He can tell them aliens founded the nation if he wants to. Although I have never heard him say anything about aliens, he does teach things which are troubling. For instance, he teaches that American judges should rule according to God’s law. You hear echos of this in Trump’s recent appointment to the post of Acting Attorney General. When running for Senate, then candidate Mathew Whitaker said he believed judges needed to have a biblical view of justice (no, a Constitutional view is the standard). Did he take a class with Barton? I don’t know. But I do know that Barton’s teachings have influenced Christian nationalism for decades. Despite a disgraced book pulled by his Christian publisher, a fake PhD claim, and multiple debunkings, he continues to have tremendous influence among those who are now in positions of great power. Although I don’t know what he said to the legislators about immigration and the states, he has talked about this before on his Wallbuilders Live show (which is taped). This claim is a doozy because he has to butcher Thomas Jefferson’s words to make both healthcare and immigration state functions. I have an entire post on this which you can read here. Did your legislator attend this meeting? If so, did your tax dollars pay for it? Might be worth checking into.